A sufficient vitamin D level is fundamental for good health! Found in every cell of your body, vitamin D acts as both a hormone and a vitamin, and it plays a role in numerous body functions. To be at your best, you need adequate levels of Vitamin D! A calcium helper: Calcium is a mineral that needs guidance. It tends to get lost in soft tissue and needs help finding its way into bones and teeth where it belongs. 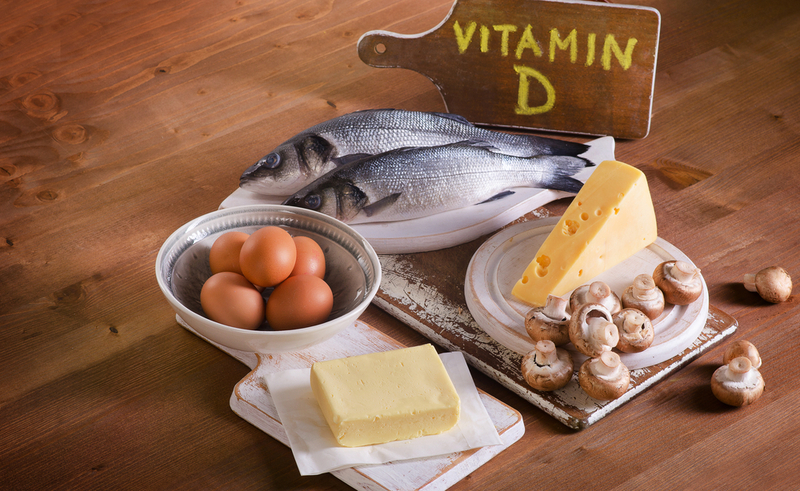 Vitamin D helps calcium find its way into bones and teeth, keeping them healthy and strong. Vitamin D also blocks parathyroid hormone, which reabsorbs bone tissue and causes bones to become thin and brittle. Supports the immune system: Vitamin D keeps the immune system strong. There is also growing evidence that optimal levels help protect against cancer. Stabilizes mood: Low levels of vitamin D have long been associated with a higher incidence of depression. Maintains healthy weight: Low levels of vitamin D can interfere with adequate production and effectiveness of leptin. Leptin is the hormone that tells us when we are full. When levels of leptin are suboptimal, it takes more food to feel satiated and you will likely have strong cravings for sugar and carbs. The current conventional guideline for vitamin D is a minimum level of 20 ng/mL, but to guarantee sufficiency the recommended range is between 30 and 50 ng/mL for both children and adults. Functional optimal ranges, however, are between 60-80 ng/mL. Most people fall short of this optimal level. Many others even fall short of basic conventional ranges. The most ideal ways to get vitamin D are by eating a diet rich in Vitamin D containing foods and exposure to natural sunlight. Vitamin D is made in the skin when exposed to UV light from the sun. These methods are often not enough for many people because they live in zones where sunshine isn't always available, or they live lifestyles that do not support adequate time in the sun. Because of this, vitamin D deficiency is quite common, and therefore, supplementation becomes necessary for many (at least for part of the year) to maintain optimal levels. It is important to check both inactive (25 OH) and active (1,25 OH). Most doctors only check your inactive 25 OH level. The ratio between the two (1,25 OH to 25 OH) should ideally be 1:1 to 1.5:1, some say up to 2:1. Ratios higher than this are often correlated with a chronic inflammatory process of some kind. Inflammatory processes can cause excess amounts of vitamin D to be shunted into the 1,25 OH (active form) pathway and inhibit the VDR (vitamin D receptors) within cells. Read Inflammation and vitamin D: the infection connection here, (3) for more information about the inflammatory connection and how to supplement Vitamin D.
For information about how to reduce EMF exposure, read Practical Tips to Protect Yourself Against Toxic EMF Radiation. Supplementing with vitamin D in the presence of low 25 OH but elevated 1,25 OH can fuel the inflammatory process. In this case, supplementing can be very damaging to the body, especially the kidneys. All this said, if your 25 OH comes in low (and you don't know your 1,25 level) then it's highly likely that you do need to support vitamin D levels somehow; either by taking a supplement or getting more sunlight exposure. Though, to make sure supplementation is the best choice for you, I do suggest checking both levels, especially when your 25 OH levels begin to rise after supplementing -- to be sure there is no shunting going on. This is especially important if you are dealing with chronic health issues of any kind. On the positive note, checking both vitamin D levels can provide a grand clue into healing opportunities that you may not have been aware of otherwise. If My Ratios Are Off, What Should I Do? If you discover that your ratios are off, I suggest holding off on supplementation while you pursue a functional lab workup that can assess for hidden stressors that can drive a chronic inflammatory response. Viome Gut and Metabolic Intelligence Test (Read more about this test here). When hidden stressors are identified and adequately addressed, inflammation will recede, and vitamin D metabolism can be restored to optimal functioning. You can discuss your case with me! Go to my Work with Me page to find out how. 1. Rejnmark, Lars. “Effects of Vitamin d on Muscle Function and Performance: a Review of Evidence from Randomized Controlled Trials.” Therapeutic Advances in Chronic Disease, SAGE Publications, Jan. 2011, www.ncbi.nlm.nih.gov/pmc/articles/PMC3513873/. 2. Mehta, Varshil, and Shivika Agarwal. “Does Vitamin D Deficiency Lead to Hypertension?” Cureus, Cureus, 17 Feb. 2017, www.ncbi.nlm.nih.gov/pmc/articles/PMC5356990/. 3. Mangin, Meg, et al. “Inflammation and Vitamin D: the Infection Connection.” Inflammation Research : Official Journal of the European Histamine Research Society ... [Et Al. ], Springer Basel, 2014, www.ncbi.nlm.nih.gov/pmc/articles/PMC4160567/?fbclid=IwAR2SoNT5854c7xcqQiPuVDU2bB5hSzAJaH_E4Q38yQe2aCM7l-_fYpmf4pg.